TYPE OF WINE: Top of the range rosé wine. AGEING: 15 months “bajo lías” in French oak. FREE SULPHUROUS ANHYDRIDE: 16 mg/l. TOTAL SULPHUROUS ANHYDRIDE: 83 mg/l. TOTAL ACIDITY (TARTARIC): 5,55 g/l. VOLATILE ACIDITY (ACETIC): 0,37 g/l. SIGHT: Light red color, with pumpkin dye even vermilion and ruby reflections in thin layer. On a bright and clear surface. NOSE: Wine kindly enough to give us a shameless herbaceous character. Intense aroma of blackcurrant sprouts and ripe forest fruits. Memories of anises. MOUTH: Wine with sweet tooth that shows us the pleasantness of this variety. 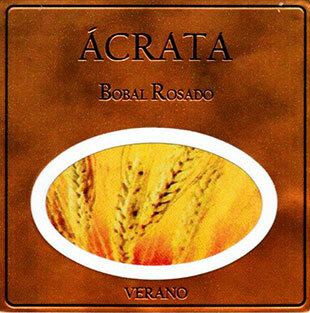 Tannin well worked with roasted notes, toast that lengthens the pleasant sensation in the mouth. ALCOHOLIC FERMENTATION: 12 months “bajo lías” in french oak barrels at a temperature of 15º C.
LENGTH OF TIME IN BARREL: 15 months in French oak barrels. AGE OF THE BARRELS: 5th year. DATE OF BOTTLED: April 2017. 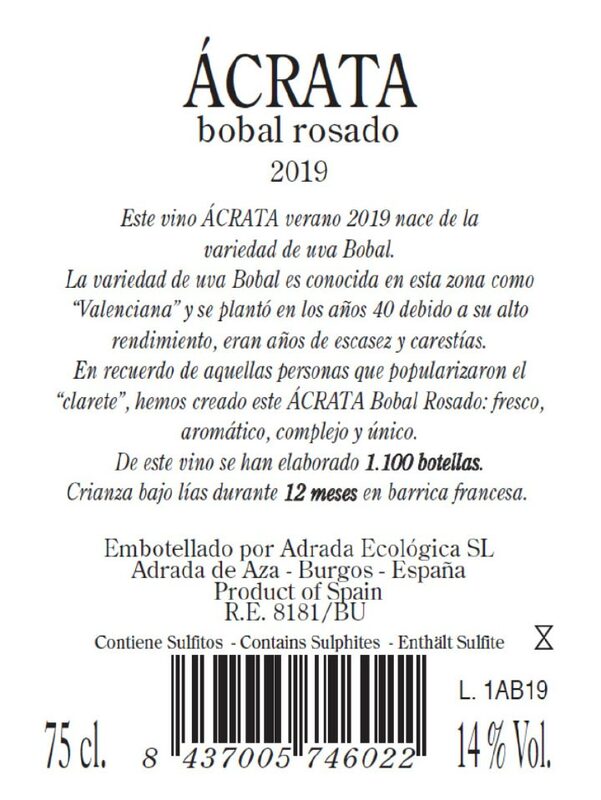 GRAPE VARIETY: Bobal 100 %. SURFACE AREA OF VINEYARDS: 2 Hectares. PRODUCTION YIELD, KILOS OF GRAPE PER HECTARE: 2.000 kg/Ha. ALTITUDE: 900 – 1.000 meters above sea level. CORK: Natural. Measurements: 48 mm x 24 mm. BOTTLE: 75 cl Borgoña Optima Stylus. Height: 296 mm. Diameter: 803 mm. Weight: 395 g. Colour: moss.